The grand opening of "La Feria de Abril" is called "El Alumbrado" (the lighting) and begins every year with the official lighting of the lanterns where half a million little lights are turned on at once, especially at the main gate. The fair is officially opened on Monday at midnight, normally 2 weeks after Holy Week (Easter - Semana Santa), and ends with a fireworks display the following Sunday, again, at midnight. Each caseta has it's own decoration.There are more than a thousand individual tents (casetas) but still there are so many petitions for casetas that must be rejected, that city officials start considering a new location for the fair. HELL street!! !Next to the Feria you find a huge lunapark, called "Calle del Infierno" - Hell's street. When you walk around there you understand why it got this name. You can find merry go rounds but also some spectacular and impressive machinery that only seems to have the objective to get your head spinning, by going round and round and upside down. Seville's April Fair was founded in 1846, surprisingly, by two none-sevillians, a Basque and a Catalan. The initial aim of these two industrious founders was no other than to improve business (trade and agriculture). However, in a few years time the local people managed to change the character of the fair into something more festive. It has now converted to one of the mayor folkloric celebrations in Spain and one of the main tourist attractions of Seville. Even so, the local people still do trade and close deals at the fair, still complying with the original intentions of the April fair. 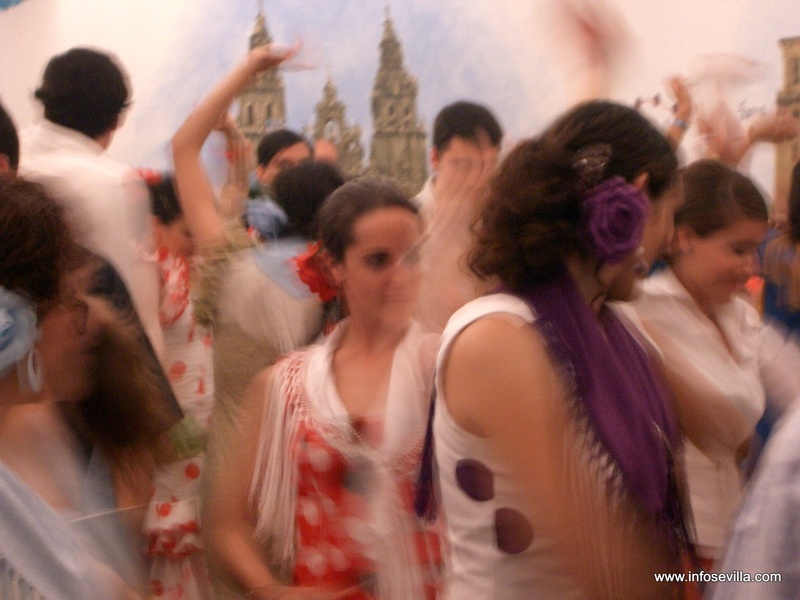 The Seville fair is celebrated on an huge open site (about 1500 x 700 meters), just out of the city center, to the south of the Los Remedios quarter, opposite of the Maria Luisa park. On this site, the Seville people and companies construct thousands of small, temporary "houses" of cardboard walls and canvas roofing, known as casetas. The result is an ephemeral city that only needs to last one week. The main entrance gate is a huge temporary cardboard monument that each year resembles one of the city's prominent buildings or sites and the streets are lit by hundreds of thousands of light bulbs and lanterns. In the afternoon, one should not miss the majestic parade of carts and horses, being the horse riders dressed in the typical "traje corto" (Andalusian country worker suit). The street animation never ends, either day or night.